Hi-Tech has been helping its customers in determining fluid forces on baffles, baffle plates, shafts, impellers and tank walls in mixing or agitating tanks to withstand fluid forces generated by high speed impellers, eliminating the classical methods of hand based torque calculations. Our team of experts can extract the pressure drop and pressure distribution in the mixers to determine the head number and solvent extraction through Computational Fluid Dynamics (CFD) simulations. 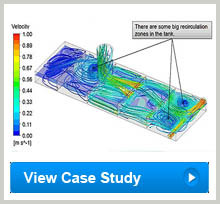 Our CFD solutions are aimed to determine the flow fields in tanks and mixing tanks for design improvements, thereby reducing operating costs and minimizing maintenance issues. We analyze different case scenarios such as investigating the free surface movement of liquid in tanks, effect of varying accelerations on the liquid gas levels and comparing the effects of baffles on sloshing intensities for application specific design optimizations.